Special Offer : Casa Orcia is offered even for 4 nights during the available weeks in November, December and January. Farmhouse Casa Orcia is situated in the province of Siena in the peaceful heart of Val d'Orcia, a beautiful landscape of UNESCO patrimony. With Mount Amiata as the backdrop, Farmhouse Casa Orcia sits at a predominant location suitable for those who prefer to have a quiet family vacation away from the buzz of the city life. Casa Orcia is a fantastic vacation rental home that offers a great escape into the serene country atmosphere. The villa is surrounded by old typical towns and villages which showcase the history of the region with pride and honour, celebrating all the medieval and local festivals as they have done for centuries. Travelling through this area is a real visual treat; The waverly hills with Cyprus bordered is spotted with medieval villages and towers. There are large country homes and a constant changing landscape depending on the crops of the season. From this location one can easily take one day trips to Florence, Siena, Cortona, Montepulciano, Montalcino and venture over the hill to discover the magnificent coastline of Maremma only 40mins drive away. Perugia, Cortona and Arezzo are all within easy reach.At just 1.5 hrs away is the historic Rome. Amongst the nature reserve full of hares, deers, owls, Pheasants etc, the farmhouse provides the most desirable vacation dreamt of. Typical of the region, the area is full of Cyprus trees, roses, lavender, ginestra and a large pine. This varied mix of Flora and Fauna can only help one relax in the natural beauty of this corner of Tuscany. This vacation home rental is ideal for a family holiday and located between Pienza and San Quirico. There is also a small village at 1.5 kms with a bar, Pizzeria and small goods. There are many superb restaurants in all these towns and also at 3 kms the antique thermal spa baths of Bagno Vignoni and the village boasting the Roman remains, enoteca`s, restaurants, pizzerias, breathtaking views and quaint shops. This unspoilt area is one of the most famous area of the Italians. Also this is made famous by the photographers who capture the beauty of the area for postcards, books and calendars. The area offers so much due to its closeness to Siena, Pienza, Montalcino, San Quirico; the antique thermal baths of Bagno Vignoni and San Fillipo. Florence is an easy day trip. Numerous beautiful medieval villages that have been restored to perfection, still maintain their original beauty and lifestyle of the Tuscany of years gone by. The area is also a gastronomic heaven producing cheeses (famous pecorino cheeses of Pienza), fresh handmade pasta, some of the best and most noted wines of Italy.Immersed in one of Italy's superior areas of viniculture, the wine lovers can enjoy the best wines produced here at many bars and enotecas. These enoteca also serves meals, platters of cheeses and cold cuts (prosciutto, salami etc.). The residents of this land are proud of their ancient land and some still maintain the culture and heritage of the area. The locals here are very friendly and hospitable. The typical Tuscan villages here are charming, characteristic and full of history. The many small shops here with their local produce and handicrafts are the best souvenirs you can take for your loved ones. 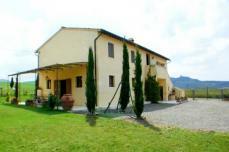 This beautiful 320 m2 farmhouse for rent is placed on two levels. The farmhouse has a spacious living room with access to a beautiful terrace. This furnished outdoor terrace is a perfect place for outdoor dining and relaxing. The farmhouse sleeps 12 in 4 double rooms, 1 twin room plus 2 extra single beds. On the ground level, there is a double room with fly screens, and a full bathroom accessible from both the bedroom and the living room. There is also a laundry on the ground floor. There is a big Pool 12.5m x 6.5m with lounges and pergola for shade. Casa Orcia is a real treat where your dreams of Italy tours come true! Andy Jun 11, 2013 17:06 Thank you for writing. I think we had a rather special privilege in meeting Sharmila and Massimo at the Mundells`. The house and your organizational services were lovely, but in particular I want to thank M & M for their kindness and advice, and in particular for inviting us to a cooking class. Italy is our favorite place to visit and we hope we`ll see you again sometime.